I've really been enjoying the fact that Josh and I are both in college this year. I never thought I'd get to go back to college and I've been so excited about this opportunity, and then with Josh starting his associates degree now too, it's just been a really fun thing for us to bond over. We both got college acceptance letters this summer and we've planning our classes. 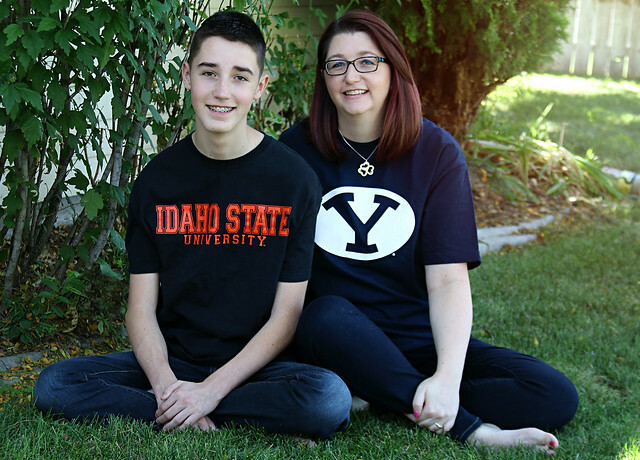 Josh is getting his degree through Idaho State University and I'm getting mine through BYU-Idaho. So I decided that it would be fun for us to get college t-shirts and do a photo shoot. Josh in his teenager-ness (I love you Josh!) gave me a bit of an eye roll at the idea, but he was a good sport, lol. I can't help it, I like pictures and this is something I want to look back on and remember later.